It’s a dish that’s worth a trip to the farmers’ market to pick out heirloom tomatoes. Viviane – the creative talent behind the fantastic online magazine foodandstyle.com – says Black Russian, Pruden’s Purple or any red heirloom beefsteak tomatoes “will be marvelous in this dish.” They’re used raw. The zucchini, meanwhile, is sautéed in extra virgin olive oil until golden brown. And the corn is boiled and then shaved from the cob with a sharp knife. 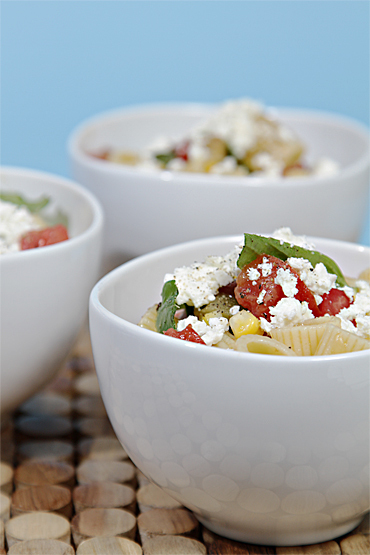 The corn, tomatoes, chives and basil are tossed with extra virgin olive oil, vinegar, garlic, salt and pepper. (Our Arbequina oil would work well in the dressing.) The pasta – mezzi rigatoni, penne rigate, ziti or ditali pasta – is added next.